Many of us here at TechSpot use Droplr on a daily basis to quickly share screenshots. While this simple app is great at what it does, since it moved to a subscription-only model I decided to look for a replacement. It’s just hard to justify paying $4.99 a month when there are quite a few options out there that work just as well. For those unfamiliar with the service, Droplr offers a quick and easy way to share not just screenshots, but also text snippets and any type of files. Want to share a quick screenshot? Press a hotkey, select an area of the screen to snap, and the resulting image is automatically uploaded along with a short link copied to your clipboard ready to share. 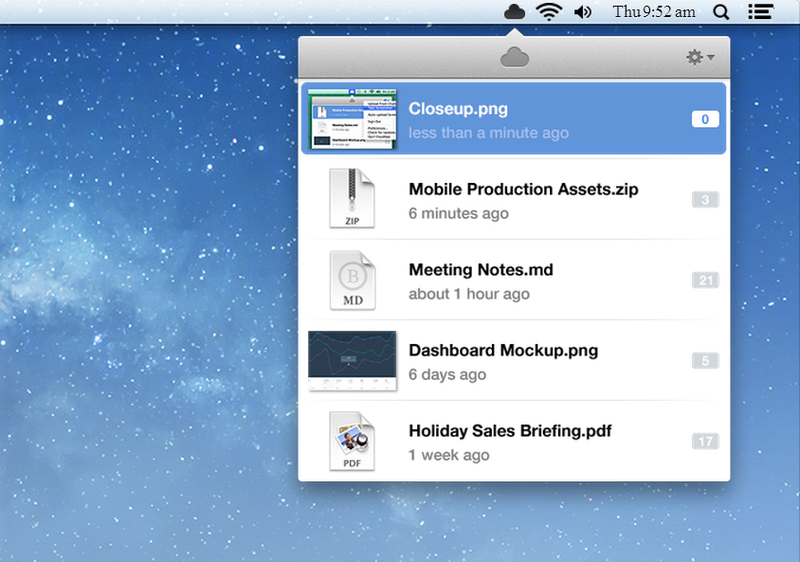 For files just drag them to Droplr’s system tray icon and they’ll be uploaded instantly. No folders, no syncing. Droplr excels at simplicity. But if, like me, you feel it’s not critical enough to your workflow to pay a monthly subscription, here are some free alternatives you should look at. CloudApp works very similar to the original Droplr. There's a global hotkey for quickly snapping screenshots as well as the option to drag any type of file to its status bar icon, with a shortened link to the image or file copied to the clipboard. Like all the alternatives listed here CloudApp is free, but you can only share up to 10 files (max 25MB each) a day. If that’s not enough there’s a Pro upgrade for $45/year which offers limitless shares, larger files sizes and your own personalized links. Downside? Available only for Mac. FluffyApp is a third-party Windows client for CloudApp and probably the closest thing to the Droplr sharing experience on the platform. It offers the same functionality plus options like automatic uploads of PrtScr presses, and ‘add text’, which offers a quick way to share texts or code. Since it's based on CloudApp you'll need to sign up for an account and are bound to the same 10 uploads per day limitation. Available only for Windows (free). 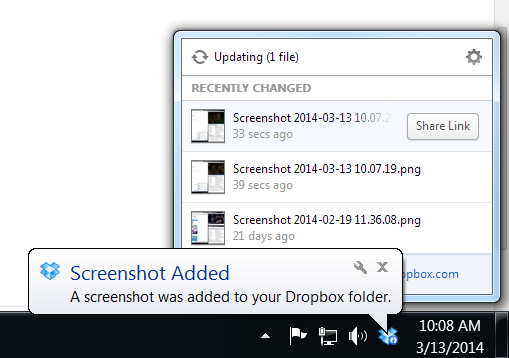 Unlike the previous two alternatives which support all types of files, this one is strictly for screenshots. The app lets you set hotkeys for full screen, selected area and active window. As soon as an image is captured and uploaded, a short link is copied to the clipboard for you to share. 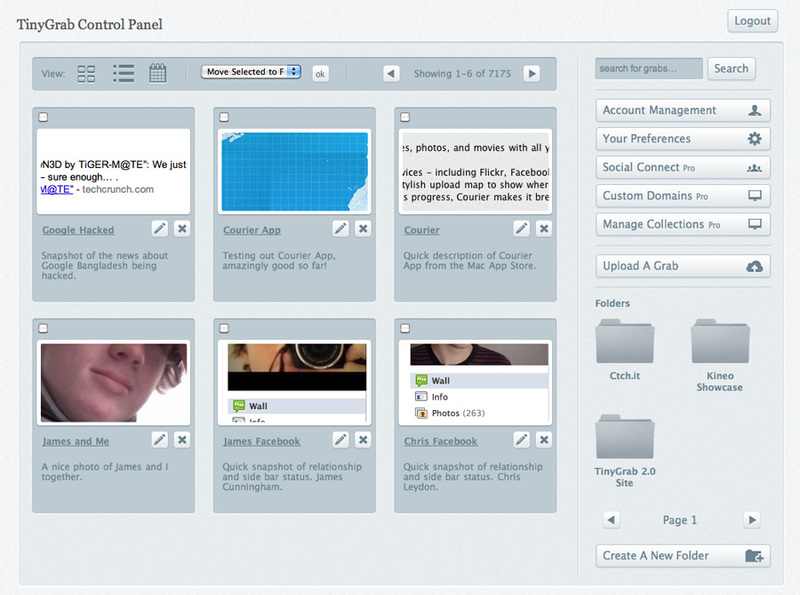 TinyGrab adds a social element by offering the option to share screenshots to Twitter, Facebook, Tumblr or by email. If you are into sharing through social networks this app saves you a step. Available for Windows and Mac free of charge with no storage limits in place. There is supposedly an iPhone client but it seems unavailable in the U.S. iTunes store at this time. Gyazo is a pretty straightforward screenshot sharing utility with the added option of capturing animated GIFs and videos (up to 10 seconds long). With the press of a hotkey you'll see a crosshair cursor to snap a specific area on your screen. Gyazo automatically uploads the image to their servers, and then opens a browser pointing to the unique URL for the image, with options to share on social networks. Although Gyazo is free on Windows, Mac, Linux there's also a premium tier for $2.99/month that gets rids of ads and adds annotation support. Monosnap is highly customizable and among its key features is the option to annotate screenshots. The latter adds an extra step into the workflow but will come in handy when you want to describe stuff within the image you are sharing. Alternatively, you can just adjust the program's settings so it skips the editor and automatically uploads screenshots or saves them to the desktop. Monosnap integrates with external providers like Dropbox, Evernote, Box.com, CloudApp or your own server via FTP if you'd rather store captures there. For the meticulous freak Monosnap's editor has an 8x magnifier for pixel perfect crops. Besides Windows, Mac and iOS, Monosnap is available for Chrome and an Android client is reportedly in the works. Skitch is hardly a replacement for the streamlined Droplr screenshot sharing experience but its powerful annotation tools make it a contender in its own right. Upon taking a screenshot the built-in editor will launch and there's no way to skip this step. You can add arrows, text, shapes, stamps and drawings to images or use the pixelate tools to blur out information. 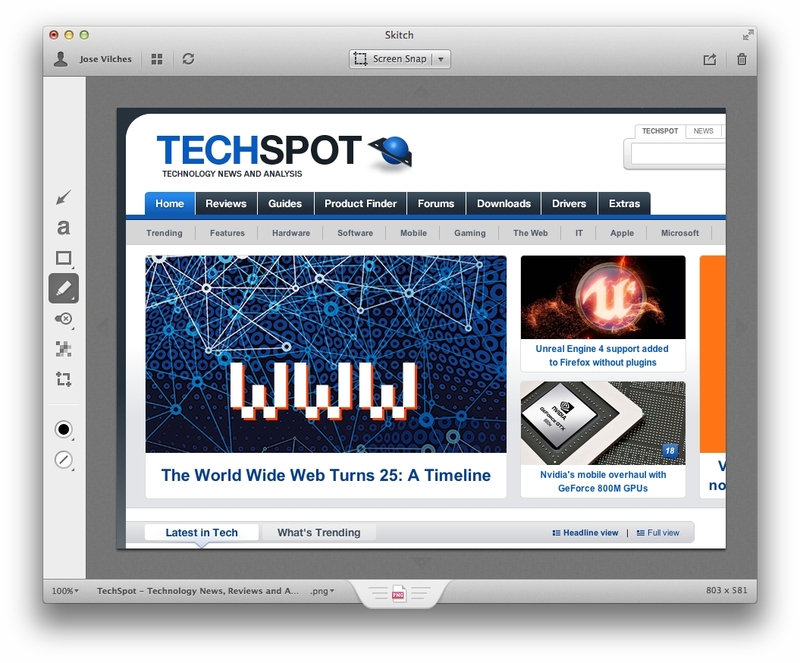 Since Evernote acquired Skitch in 2011 the two are now tightly integrated. Upon closing the editor, images are automatically uploaded to your Evernote account and count towards your free 60MB monthly quota, though you can configure it to work with your own server via FTP. 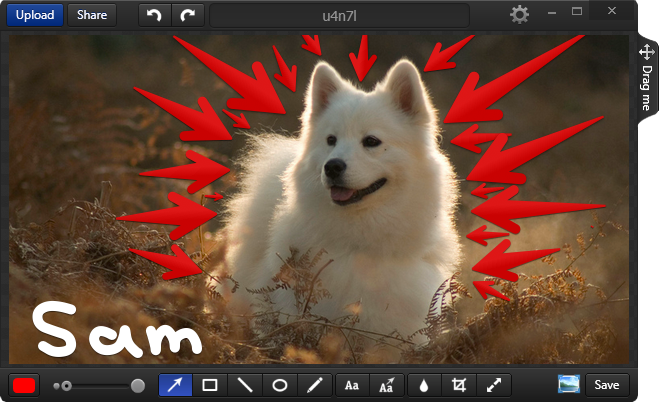 Skitch is available for free on Windows, OS X, Android and iOS. It’s not a screenshot sharing app but Dropbox can be configured to automatically upload any screenshots taken natively in Windows or OS X and copy a share URL to your clipboard. Alternatively you can save a screenshot to any folder within your Dropbox and press the share link button -- just like you would with any other file. Although there's no annotation feature it's a competent alternative if you are already using the service.